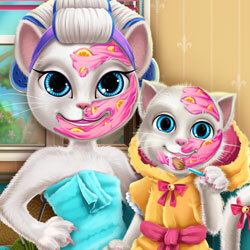 Description: Our cute furry kitty likes to pamper her daughter with the finest spa products before taking her to school, will you join them? Discover what kind of beauty masks kitty mommy uses and apply the treatments to see the results. Create a fancy look for the mom with sparkly eye shadows and shimmery lipsticks. At the end pick out stylish outfits and beautiful hairdos for both kitties to make them look meowtastic.